Marko Arnautovic salvaged a point for Stoke with an injury-time equaliser at West Ham. The Austrian struck after twice having a goal disallowed for offside. Aaron Cresswell's brilliant early free-kick had put West Ham ahead, but Stoke dominated for much of the remainder of the match. Mame Biram Diouf was unlucky to see a header come off the inside of the post, but after the hosts looked to have clung on, Arnautovic struck late. Stoke's dominance of possession looked to have been fruitless, but a brilliant flick from substitute Stephen Ireland set up Arnautovic whose two earlier attempts had been correctly flagged. It was a sickening blow for West Ham manager Sam Allardyce, who had insisted before this game that he is making plans for next season with the east London club, despite his contract at Upton Park expiring in the summer. His side remain one place above Stoke in ninth, but have just one win in their last 10 Premier League outings. Stoke ended the first half on top, but they had been chasing the game from early on thanks to an outstanding piece of skill from Cresswell. After Enner Valencia, back in the side after three games out with a toe injury, had won a free kick, the ex-Ipswich left-back swung the ball powerfully over the defensive wall to leave Stoke goalkeeper Asmir Begovic with little chance. Cheikhou Kouyate also tested Begovic from outside the area, but Stoke spent much of the rest of the half in control. Victor Moses' scuffed shot deflected wide off Carl Jenkinson, but Stoke's more forceful approach came to nothing and Kouyate wasted a chance to double West Ham's lead after Valencia tore out of defence with a sharp break down the right flank. Mark Hughes' side kept pressing after half-time to claw something from the game and end their run of three consecutive defeats. Of goals conceded by Stoke this season, 45% have come courtesy of set-piece situations. The first of Arnautovic's disallowed goals preceded a chance for Diouf to equalise, but after the substitute had shaken off his defender he saw his header rebound to safety off the inside of the post. Kouyate's firm shot was kept out by Begovic at his near post, but the latter stages of the match saw Stoke pour forward. 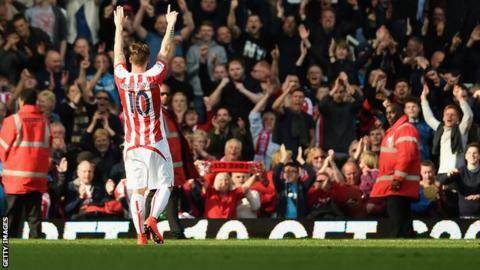 Arnautovic saw another goal chalked off, but there was no doubt about his dramatic equaliser. Ireland deceived the home defence with a deft touch, allowing his team-mate to race in on goal before driving the ball past Adrian into the bottom corner. West Ham manager Sam Allardyce: "It's bewildering at the moment, since Manchester United we have thrown seven points away in the final seconds of the game. "You tally those up, that's 50 points, looking good and its a really good season, but throwing this one away is bitterly disappointing. "The lads showed a lot of nerves, and it was a very good goal from Stoke but it is difficult to take. We have to be more capable of seeing the game out." Stoke City manager Mark Hughes: "For us it was one of those days, we conceded to a great free-kick but we kept going and showed great character. "We could not quite find the final ball, but credit to the lads because they stuck at it and deserved to get something. They were the better team, so we got some reward but probably not what they should have had." Match ends, West Ham United 1, Stoke City 1. Second Half ends, West Ham United 1, Stoke City 1. Goal! West Ham United 1, Stoke City 1. Marko Arnautovic (Stoke City) right footed shot from the right side of the box to the bottom left corner. Assisted by Ryan Shawcross with a headed pass. Offside, Stoke City. Stephen Ireland tries a through ball, but Marko Arnautovic is caught offside. Attempt missed. Charlie Adam (Stoke City) right footed shot from the centre of the box misses to the left. Assisted by Stephen Ireland. Offside, Stoke City. Mame Biram Diouf tries a through ball, but Steven N'Zonzi is caught offside. Attempt missed. Carlton Cole (West Ham United) header from the centre of the box is close, but misses to the left. Assisted by Stewart Downing with a cross. Carlton Cole (West Ham United) is shown the yellow card for a bad foul. Attempt missed. Stephen Ireland (Stoke City) right footed shot from outside the box is too high. Assisted by Marko Arnautovic. Corner, West Ham United. Conceded by Geoff Cameron. Mame Biram Diouf (Stoke City) hits the right post with a header from the centre of the box. Assisted by Stephen Ireland with a cross. Kevin Nolan (West Ham United) is shown the yellow card for a bad foul. Offside, West Ham United. Morgan Amalfitano tries a through ball, but Carlton Cole is caught offside. Attempt blocked. Charlie Adam (Stoke City) right footed shot from outside the box is blocked. Assisted by Steven N'Zonzi. Attempt blocked. Enner Valencia (West Ham United) header from the centre of the box is blocked. Assisted by Stewart Downing with a cross. Attempt saved. Cheikhou Kouyaté (West Ham United) right footed shot from the right side of the box is saved in the bottom right corner. Assisted by Carlton Cole. Offside, West Ham United. Adrián tries a through ball, but Enner Valencia is caught offside. Offside, Stoke City. Charlie Adam tries a through ball, but Marko Arnautovic is caught offside. Substitution, West Ham United. Kevin Nolan replaces Alexandre Song.